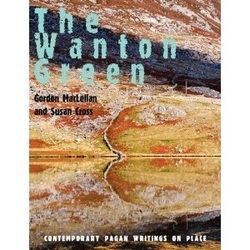 Frustrated by ‘ownership’ claims to land at green conferences (if couched in terms of ‘stewardship’ or ‘custodianship’), Gordon MacLellan initiated this volume as an opportunity for pagans to celebrate a sense of place as “wild, free, unbridled, sensuous... curling” with “connections...everywhere” and inclusive: “from far-off hills to... urban window-boxes”. Unfortunately, there are sometimes too many far off hills here and not enough window boxes. These essays, despite the almost bewildering range of beliefs and practices they represent (craft, Wiccan, Pan-worship, animism, magick and so on), too often offer up familiar romantic beliefs in landscape form. Where, however, the general reader does have much to gain from a reading is in those pieces, such as those of Julian Vayne and Stephen Grasso, where a twentieth century tradition of urban wandering and exploring bangs up against beliefs that propose themselves as ancient. Although it is hard not to keep thinking that Arthur Machen has been here before, nevertheless the collision in ‘The Wanton Green’ still knocks precious splinters of experience and reflection from the Moloch of contemporary economy. What (if you pardon the phrase) most bedevils this book, is vagueness and this begins in Graham Harvey’s Foreword, which inventively draws on Debbie Rose’s arguments to upturn the meaning of “wild” (abused) against “quiet” (cared for) country, applies “social” beyond the human, and argues powerfully for breaking down the distinction between ‘human’ and ‘natural’, but then collapses all that back into “belonging”; the Romantic re-emerges, subjective and anthropocentric (and domestic: “knowing where you belong begins with having a sense of home”) from the wanton green. What is sometimes a negotiation – such as Emma Restall Orr’s bargaining with ‘green gods’in her back garden – too often becomes a queasy synthesis of belonging (which seems only to invert rather than subvert ‘ownership’) and subjectivity that tarnishes a number of the essays here: with confessional passages that overstay their welcome, dreams of dragons that are rather too easy to subjectively locate (the author does it herself: “I had kept grass snakes as pets.. I loved letting them slide over my arms and legs”) and a self-focus that occasionally topples over into hubris: “The water holds the place/of my deep knowing/of the past”. A more productive balance between these elements is struck by Julian Vayne. Locating his exploration of place in childhood play, Vayne is exemplary in the way that his writing is temporally and spatially inclusive: “I could feel the multiple layers. Like the soil shot through by shredded bin liners”. He (at last!) brings specificity to his descriptions of a place – Blaise Castle on the fringes of Bristol. (For a book on place there is simply not enough care taken in the specific detail of places; performance maker and academic Mike Pearson recommends that at least two thirds of any documentation of a site-specific performance should be about the site. In Woody Fox’s paper, in contrast, we learn of a move from city to Devon countryside but all we learn of the county is its “beautiful birdsong” and “leafy lanes” – prose that could come from a tourism brochure). With Vayne we meet Pan, watch the construction of “shrines”, are invited to make Goldsworthy-like art interventions and get some good advice on ambulatory exploration such as breaking from chit chat, touching things, watching “for omens in pub signs and random graffiti”, and oscillating “from the view of the mouse to that of the hawk” (similar to Mythogeography’s advocacy of a combination of similar viewpoints advocated by Tim Ingold [immersed] and Doreen Massey [satellite]). His description of ‘museum level’ as the dose of a psychoactive “where one might be able to function in a social space... and not be so wired that you get thrown out” could also be applied to the hypersensitization (with or without substance ingestion) of counter-tourism. Stephen Grasso’s account of London is also worth the read, though he finds far less of value in the contemporary world: instead his prose ‘drift’ across London is a descriptive howl of righteous rage against the alienation of the spectacle and the influence of the Old Boys – the pinched magic of the powerful, burying older forces who, Grasso promises, are playing “a longer game”. While there is always a danger of a rough nostalgia in this approach (and some of this territory will be familiar to readers of Ackroyd, Sinclair and Moore), Grasso turns his wrath into proposals for action: “(M)ake ambassadorial visits to the boneyards of your patch and strike up alliances with the local dead. Hear the opinions and grievances of the skeleton court and provide a medium for their cobwebbed voices to be heard above the ground... Inhabit... the chill wind and cold drizzle of your town”. At times there is an imprecision in the essays of The Wanton Green that undermines confidence in the arguments and assertions: vague references to lost cities and sunken villages, to rivers with “hidden depths”. In Robert J. Wallis’s piece on Mugwort a confident assigning of a sculpture to a portrayal of this herb in the main text becomes an “almost certainly depicting” in the accompanying caption. Even in Jenny Blain’s otherwise movingly-described journey a ‘heritijism’ pops up: “every footfall echoed with history”. We fancy that Tim Brennan will be surprised to find himself cited as he is by Mogg Morgan (the reference does not suggest the writer knows much more of this artist’s work than the press report quoted). Greg Humphries calls Caspar David Friedrich a “forerunner” of the Romantic Movement and describes land artist Robert Smithson as “egocentric” on the basis of one iconic work, whereas much of Smithson’s (often smaller scale) work and his land-based writing is far less ego-driven than many of the papers in this collection. Robert J. Wallis frankly proposes that “as Heathens today we inevitably need to be creative in our reconstruction of the past” and this is no different from contemporary academic approaches such as ‘anticipatory history’ or Tim Edensor’s comments in his book ‘Industrial Ruins’ (quoting Avery Gordon) about the requirement to “make things up in the interstices of the factual and the fabulous”. However, some of the papers here could be more open about their creativity. The editors (and most of the writers) assume an anti-establishment orientation, but very occasionally a different kind of attitude sneaks out (and this is where precision and openness become more crucial) – a concern with and for power. Melissa Harrington notes the British Royal family’s ‘adopting’ of “Windsor of all places... the magical current there is unlike any other”, but seems neutral and unconcerned (unlike Grasso). Wallis quotes, approvingly, Viveiro de Castro’s inversion of the uninatural and multicultural ontology of “rational materialism” into a multinatural and unicultural one. Why not multiplicity in both nature and culture? Here it seems MacLellan’s synthesis is prised apart and, although this is only a minority tendency in this collection, something sinister emerges about “belonging” in the meeting of imprecision, power and subjectivity.